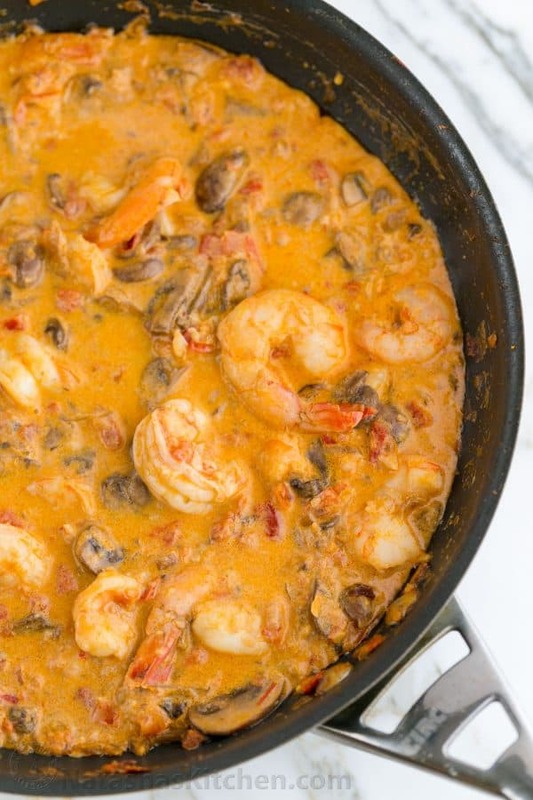 This shrimp and mushrooms sauce is luscious, juicy and just succulent. 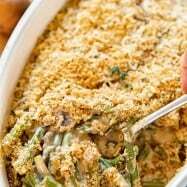 It’s delicious over mashed potatoes, rice or pasta, making it an all-around great dish! I also discovered that it reheats wonderfully so you can make it a day ahead and warm it up stove-top before serving. 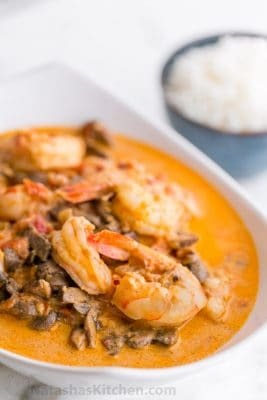 We stopped in to visit friends in Nevada on our way home from California a couple weeks ago and Lyuda (who sure knows her way around the kitchen), served us an amazing lunch which included this shrimp and mushroom garlic bisque sauce over some fluffy white rice. I shamelessly re-filled my plate 4 times. It was an instant favorite. Lyuda shared the recipe with me and I’ve already served it to company at our house, this time over chive mashed potatoes. It was a hit! 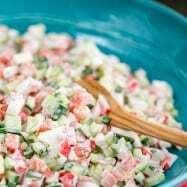 Lyuda also gave me her recipe for a delicious crab salad that she served and I will post it soon (stay tuned!). 2. 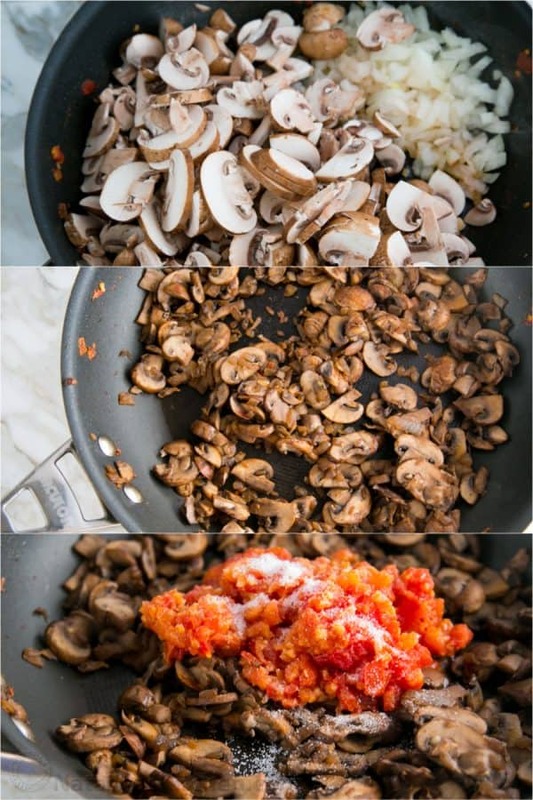 In the same skillet over med/high heat, caramelize your diced onions and sliced mushrooms then add the tomato mixture back into the same pan. 3. Add 1 tsp salt, 1/2 cup sour cream and 1 Tbsp chili sauce. Stir to combine. Add in 1 1/2 cups chicken broth and stir to combine. 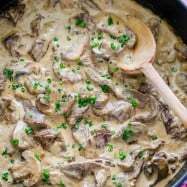 Let the sauce cool down a little bit (it will thicken a little as it cools) then serve over your favorite plain rice, pasta or mashed potatoes. It’s soooo good! These pictures don’t even do it justice. If you could just chomp down on one of these juicy shrimpers. Oh goodness! 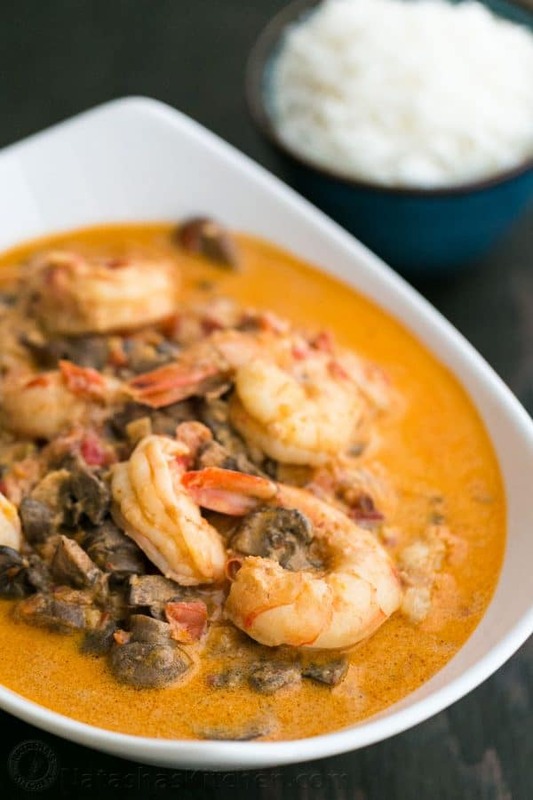 This shrimp and mushroom sauce is luscious, juicy and just succulent. It's great over mashed potatoes, rice or pasta, making it an all-around great dish! I also discovered that it reheats wonderfully so you can make it a day ahead and warm it up stove-top before serving. 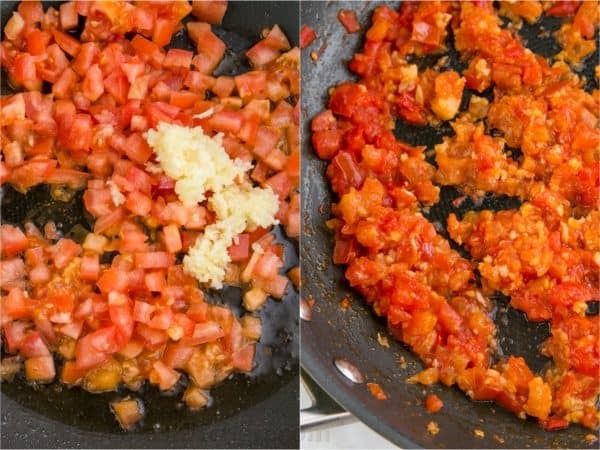 In a large heavy bottom skillet or a WOK, combine your diced tomatoes and pressed garlic with 3 Tbsp olive oil and simmer uncovered over medium heat until tomatoes are soft and release their juices (10-12 min). Remove your tomatoes and set aside. 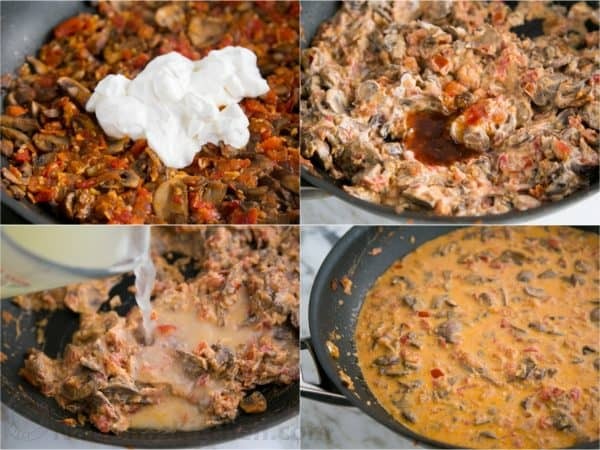 Add 1 tsp salt, 1/2 cup sour cream and 1 Tbsp chili sauce. Stir to combine. Add in 1 1/2 cups chicken broth and stir to combine. 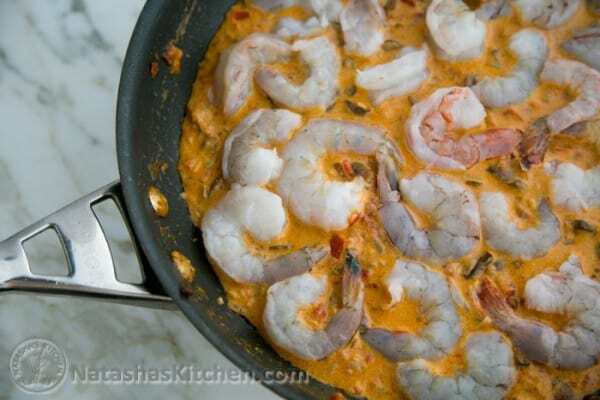 Bring your sauce to a simmer over med/high heat and add in the shrimp. 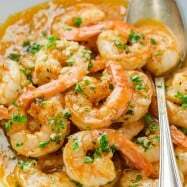 Turn the shrimp a couple times in the sauce while cooking and simmer until shrimp is cooked through. Don't overcook or your shrimp will turn rubbery. 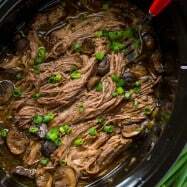 Let the sauce cool down a little bit (it will thicken a little as it cools) then serve over your favorite plain rice, pasta or mashed potatoes. 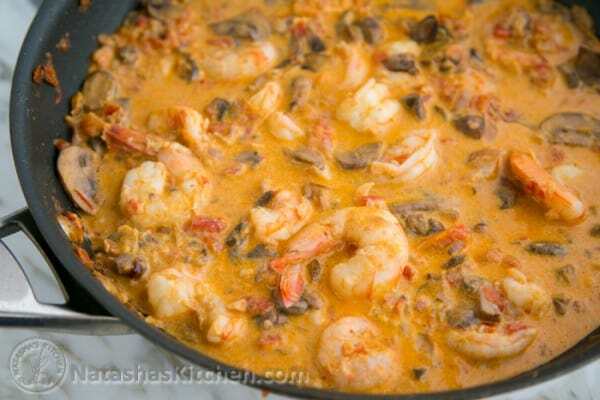 I just have a dinner, yes I made this recipe, Shrimp and Mushrooms in a Garlic Sauce. 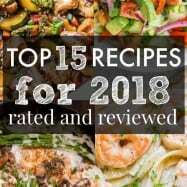 It’s so easy to do, and the taste is so delicious. For sure, I recommend this recipe and try to do it. You not going to regret, my husband really enjoy it. 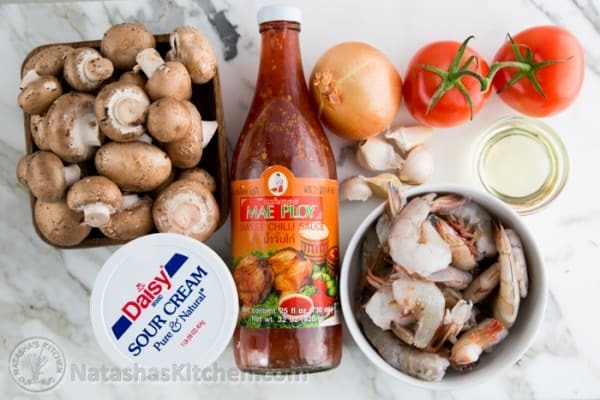 I stumbled on your blog by luck, when looking for shrimp and mushroom recipe. I had all in the ingredients at hand, so I gave it a shot. Just made this dish today. The flavors are excellent! The only thing I would change is adding a bit more salt and add pepper to taste. Next time around I might add red pepper flakes for an extra kick. Just made this for dinner tonight, delicious! I usually add lots of spices to my cooking, couldn’t believe this turned this yummy with nothing but salt! It’s so great to know that it works well! Thank you so much for sharing that with me. You’re awesome! Made it for dinner, it was a hit! My eight year old is not a fan of mushrooms so maybe next time I will put a little less of them, otherwise I got two thumbs up.